The 78th Pennsylvania finishes acting as a rear-guard for Negley’s column, form ups, and follows. Their skirmishers note the presence of Hindman’s Division at the Vittetoe farm. 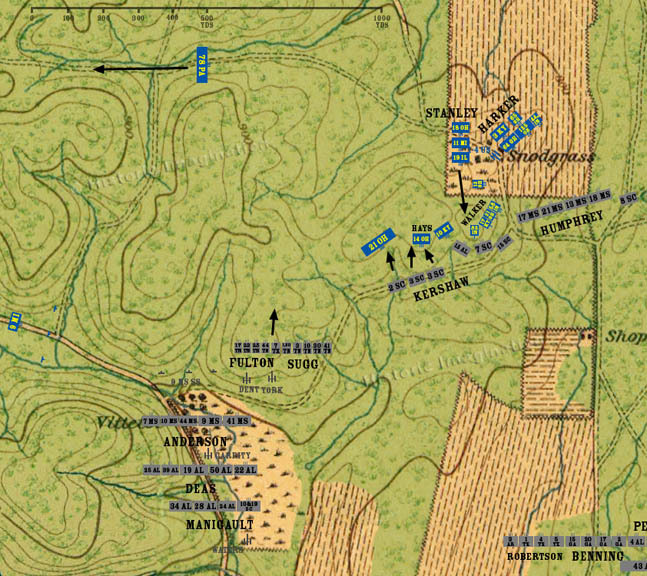 Kershaw orders the rest of his brigade to attack to support the unauthorized charge of the 15th Alabama and 7th South Carolina. Hill One is almost captured by the attack, but Stanley’s Union brigade counterattacks up the Hill to their relief. Humphrey’s Brigade arrives at the edge of the Snodgrass cornfield. General Humphreys looks at Harker’s brigade and the miscalleneous units assembled there, decides the position is too strong, and doesn’t even try to attack.